Provide comfortable seating for 6 people in a friendly seating arrangement. 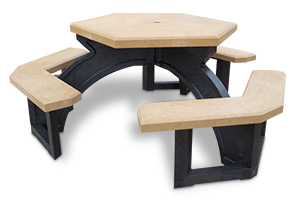 This attractive hexagon picnic table is constructed of 10 one-piece molded shapes. This eliminates cumbersome assembly associated with other "stick-together" versions. Beveled edges on both the table top and seats are an added feature that sets this table a step above the rest. A great addition for local parks, downtown areas, and outdoor eating facilities. The all-plastic design and solid construction are made to withstand hard use and provide a durable table that will maintain its appearance year after year. P-10SS-2 and P-11SS-2 include Stainless Steel hardware.